Peninsula Art Space is pleased to present Nothing Will Be Lost, a group exhibition curated by Marion Guiraud and featuring works by Izabela Gola, Jesse Greenberg, Robyn Hasty, James Reddington and Corey Riddell, which engage with experimental practices as a means to question time through the relocation of medium and materials. The exhibition locates experimental practices within processes of investigation entailing a dual set of actions. Through direct action upon materials, experimental practices further a medium’s potentiality while relocating its working parameters to other layers of expression. This relocation happens outside, besides, or beyond their usual and definite functions, allowing a simultaneous de-functionalization and re-functionalization of the explored material. Oscillating between entropy and formation, investigation and re-composition, the works in the exhibition challenge as much as they assert the physical presence and substance of materials. In Thresholds (2014), a multimedia, time-based installation, Izabela Gola uses film, video and sculptural works to create a structural platform for reflection upon memory and identity. Drawing from Hollywood films and Eastern European cinema, Thresholds choreographs a cross-cultural and cross-generational dialogue that challenges cinematic conventions and strategies through appropriations, amplifications and subversions. In her installation, Gola also questions the psychological reflexivity intrinsic to filmic narrative, and uses the filmic apparatus as a malleable sculptural medium. 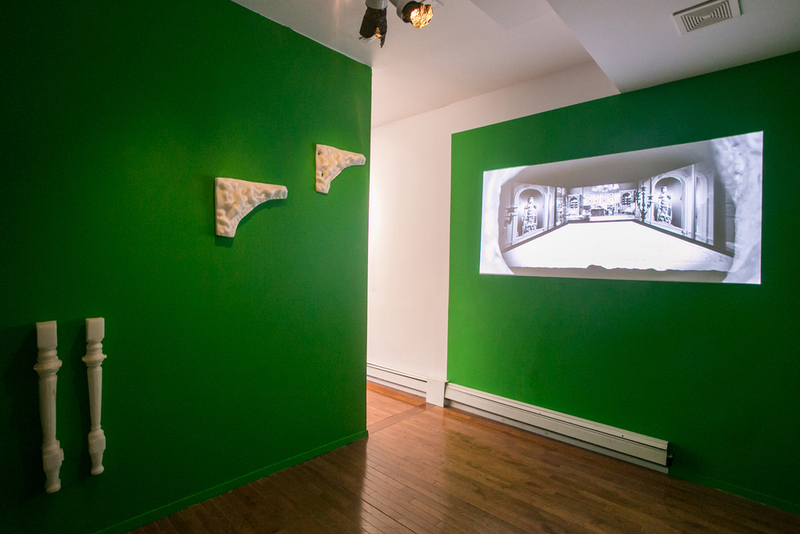 The installation includes three-dimensional sculptures, analogous to several of the visuals encountered in her video. Made out of wax, these sculptures evoke the ephemerality and malleability of memorization processes and associations. By relocating objects from the cinematic-two dimensional space to the spectators’ space, Gola intertwines real and fictional elements to address psychological disorders and reconstruction of displaced identity. Jesse Greenberg explores the transformative and mutational states of materials as revealed through time-based and process-based manipulations. Made out of urethane plastic, his work exploits the changing quality of the material, as his wall-mounted sculptures oscillate between entropic conditions and formation, creation and destruction. Working with the crystallization of the urethane resin in its unprocessed, liquid, a most furtive form, Greenberg’s pieces become the solid, tangible trace of an otherwise ephemeral moment; the material affirming its underlying and substantial nature. Allowing chance and physical properties to come into play, Greenberg’s work develops an intimate experience with materials and their inner states of transformation. In Hourglass, Robyn Hasty explores the physicality of the image, and paradoxically its fragility as a moment in time captured on glass. For this body of work, Hasty uses a collodion wet plate process, by which only two photographs may be produced during a two-hour shoot. The slowness of the process, unfolding over time, allows the subjects and the photographer to share in a moment of intimacy and vulnerability where the roles of power shift. As physical objects, Hasty’s photographs address time through their singularity and their fragility, always at risk of being lost should their support, a highly breakable sheet of glass, be broken. Suspended from the ceiling, the image appear and disappear as they are viewed in the round, touching on the uncertainty of their own existence. In these ways, the object nature of the “Hourglass” plates, both solid and delicate, is integral to their meaning, allowing them to confront the proliferation of imagery in the digital world, and the illusion of immortality offered by infinite multiplicity. In "…we chased her all the way down the Susquehanna!”, James Reddington subverts the mechanical scanner apparatus to compose images that suggest the inevitable distortion imposed by memory upon experience. 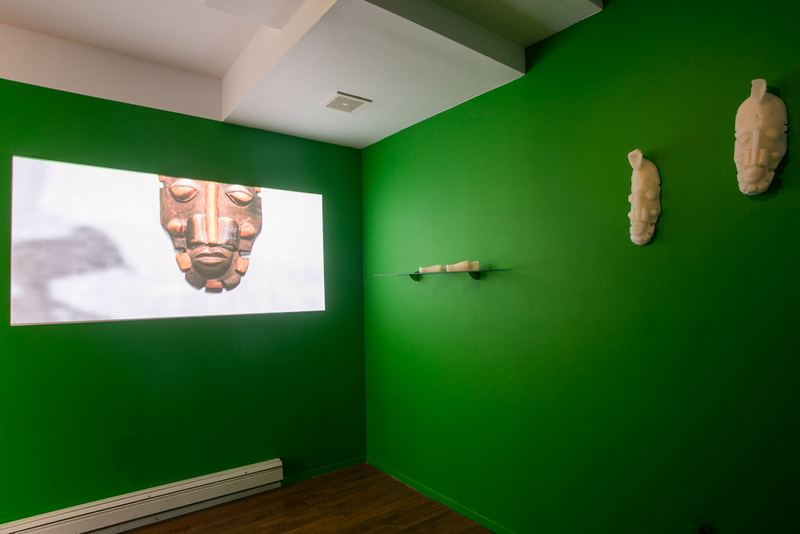 The scanner, an automated medium that digitalizes documents placed on its flat screen, is relocated and repurposed into an apparatus that allows three-dimensional compositions and manipulations. Borrowing from panoramic photography, collage, and painting, "…we chased her all the way down the Susquehanna!”, is composed of multiple scans of a live-size mannequin combined mosaically to create a seamless composition. Reddington’s unique use of digital scanning exploits the medium’s photographic and distortive qualities to create a whimsical and ethereal image, which looses its informational value to become a mystical embodiment of dreams and memories. 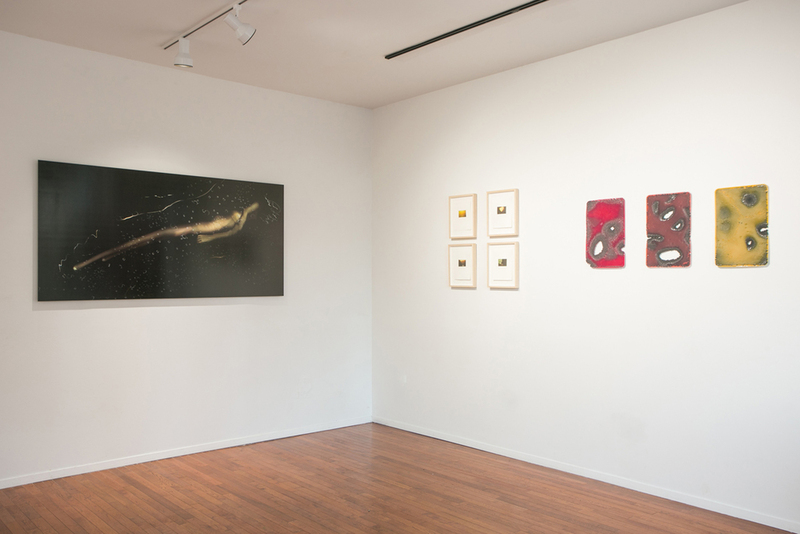 Corey Riddell’s solstice portal I-IV, are still frames pulled from a 16mm experimental film that are printed as photogravures through a photo-mechanical process originating in the 19th century and similar to intaglio printmaking. Each image is broken down into four CMYK copper plates, which are inked and printed one on top of the other by hand in an etching press. Shot during the winter solstice, the shortest day in the northern hemisphere, Riddell’s photogravures capture this very peculiar moment when the sun’s maximum elevation is at its lowest point. Riddell’s works stand as materialization of this seemingly motionless, eternal moment, where time, experiences, and measurements of time are extended and shattered. Izabela Gola was born in Kielce, Poland in 1981. Growing up in Poland, Gola was exposed to reality delineated by conflicting states of collective conscious. The struggle to retain independent identity through alternative political, cultural, and art movements of her parents generation was a response to the mundane everyday life saturated by TV and media during the communist regime. During her early practice in Poland, Gola pursued oil painting and sculpture in wood. After her arrival in the US in 2003, Gola continued with oil painting, which she then incorporated into her multimedia installations. Since 2009, video has become Gola’s primary visual language in her multidisciplinary environments. Gola’s exhibitions include a screenings at MoMA Research and Education Center (2011) and the headquarters of the World Youth Alliance at the United Nations (2011), a two-person show at The Rotary Gallery in Soho (2012), and a group show at KaKaDu Gallery in Cracov, Poland (2010). Jesse Greenberg lives and works in Brooklyn, New York. He earned a BFA in sculpture from Rhode Island School of Design and a MFA from Columbia University, New York. Recent solo and two-person exhibitions include: LOYAL, Malmö; Derek Eller, New York (both 2014); White Flags Library, St. Louis (2013); and National Park, with Lukas Geronimas, KANSAS, New York (2012). Recent group exhibitions include: Control Lapse, Josh Lilley Gallery, London; New Hells, Derek Eller, New York; Where 1, Where, New York (all 2024). Jesse Greenberg co-runs 247365, a gallery with locations in Brooklyn's Donut District and in the Lower East Side. Robyn Hasty is an interdisciplinary artist exploring cycles of crisis, revolution and transcendence affecting how we build our emotional landscapes and social structures. Her practice includes photography, printmaking, sculpture and a long history of immersive collaborative projects that attempt to whimsically and critically reimagine our world. In the past she has floated down 1,000 miles of Mississippi river with the Miss Rockaway Armada, travelled 15,000 miles across the U.S. taking Wet Plate Collodion portraits of people living off-the-grid, and created kinetic sculptures in the Arizona desert that would slowly collapse. She has received fellowships from the Jerome Foundation, PEW Center for Art and Heritage and The Frank Lloyd Wright School of Architecture. Her work has been featured in The New York Times and on NPR. She is currently an artist-in-residence at Pioneer Works Center for Art and Innovation in Red Hook, Brooklyn. James Reddington is an artist and photographer based out of Brooklyn, NY. After graduating with a BA in photography from California State University Sacramento, he set out for New York City to pursue an MFA in Photography at the School of Visual Arts. His work has been featured in several group exhibitions in California and New York including the Governors Island Art Fair in 2013. His work deals with memory, dreams, storytelling, and how photography brings all of them together. Born and raised in the fog shrouded hills of California's northern coast, Corey Riddell is an artist living and working in New York. Utilizing photo-chemically and photo-mechanically based processes, Riddell's work centers around caves, cliffs and the sea. He received his BA in Art and the History of Art and Visual Culture from the University of California Santa Cruz and his MFA from Columbia University in the city of New York.